Professor Bill Kellogg is the Department Head for the Agricultural Education and Communication Department at Cal Poly. Professor Kellogg was nice enough to let me interview him about the Agriculture Department’s connection to campus dining and his thoughts on food and nutrition. Food & Farm Facts courtesy of the Cal Poly Agriculture Department. 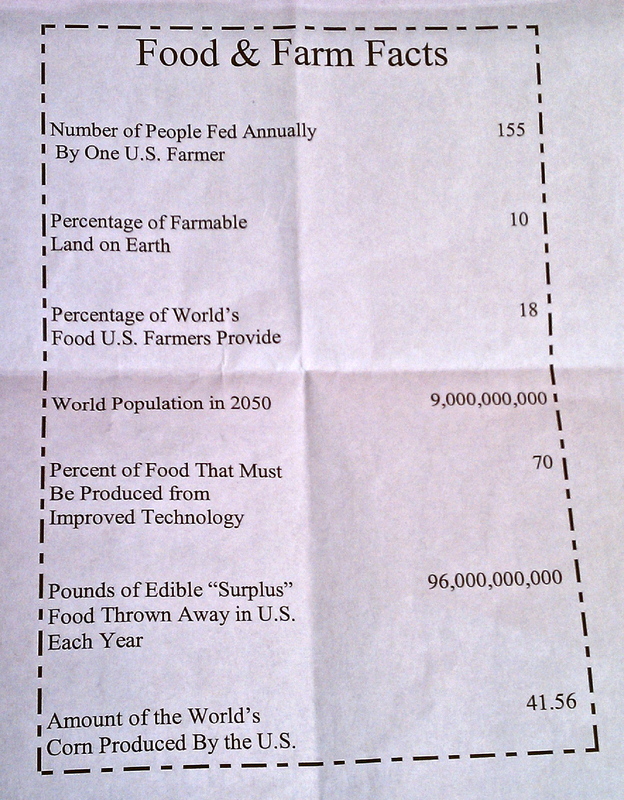 The provided Farm Facts sheet said 70% of food must be produced from improved technology. I asked Dr. Kellogg if he thought this was the result of an unhealthy and obese America, but he thought otherwise. He said it was more because of our eating habits and exercise. According to Kellogg, if parents can install better eating habits and nutrition when their children are growing up, it will go a long way. Today, more teenagers choose hamburgers and sodas which leads to obesity. One of the last questions I asked Dr. Kellogg was whether the Agriculture Department produces food for the dining restaurants. “We only produce the eggs. Most of the food is grown by students and harvested at a certain time of the year,” said Kellogg. Thus, due to the harvesting time, students are not always at school. Former student Mikaela Serafin, had recommended Professor Kellogg to me. “He is a phenomenal educator that cares about his students and the Agriculture industry,” said Serafin, “and all the while puts his heart into everything.” Mikaela is in the Agriculture Department as well, and said Kellogg would be perfect to interview about agriculture and nutrition questions. Capturing audio for the first time really broadened my interviewing competence. It was easier to record someone’s voice compared to video, where you have to take into effect the rule of thirds, the background, and your proximity to your subject. The only extra noise was the handling noise on the recorder. By hitting the stop and record buttons, there is loud clicking at the beginning and end. 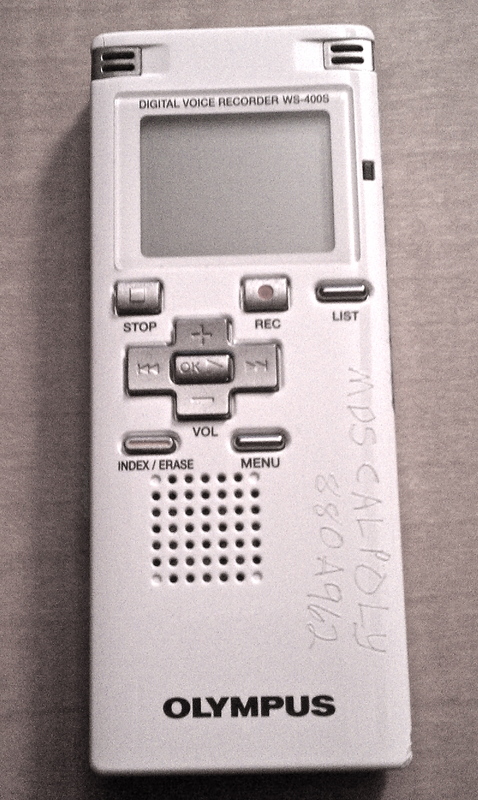 Recorder from the Media Distribution Center. I have learned it is a little easier for the person being interviewed, to be on audio rather than video. It makes them a little less nervous and able to say what they want to say. I am really excited to start editing the audio now that I have collected a few minutes worth of raw audio! I’d really like to be a part of group where I can get comments from other experienced people that share the same interest. If you have any suggestions, please let me know. Thanks a lot! I’m sorry I don’t know of any discussion boards, but you should check out the “resources” tab on my blog for more information about nutrition and college! Also, I apologize for replying a year later…this blog was for a course I took and I haven’t been eating on campus for a couple years now. I’m gone to convey my little brother, that he should also pay a visit this web site on regular basis to take updated from latest news update. I don’t know if it’s just me or if everyone else experiencing problems with your site.